Is it Healthy to Be 15 Weeks Pregnant & Haven't Gained Any Weight Yet? During your pregnancy, the amount of weight and when you gain it can vary by person. While pregnant, the average woman will gain between 25 to 35 pounds. Each trimester brings a different amount of weight gain. Now that you are eating for two, you should expect to consume about 200 to 300 calories more than normal each day. The weight gain will follow as your baby begins to mature and develop. During your first trimester, you will not experience much weight gain. The average amount gained during this period is about 2 to 4 pounds. Do not be alarmed if you haven’t gained any weight by the end of your first trimester. If you are feeling concerned, have a discussion with your doctor to make sure you are on the right track. 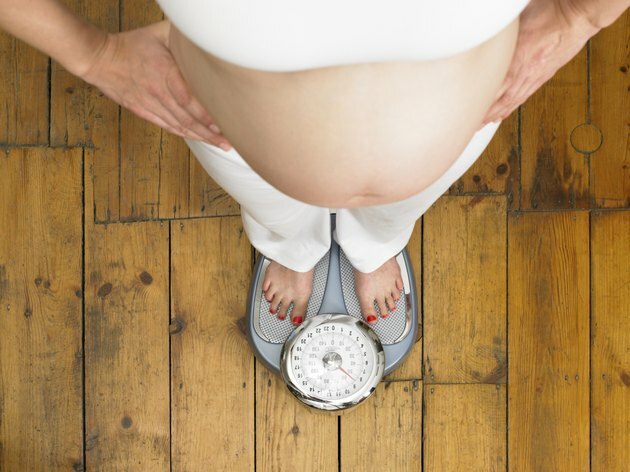 Being over or underweight before pregnancy can also influence your weight gain during this period. Underweight people may gain more, while overweight people may not gain much. Other factors such as nausea and morning sickness can decrease your ability to gain weight. As the morning sickness begins to pass you will likely see an increase in weight. The second and third trimesters are pretty similar regarding weight gain. Your baby is developing and your body must sustain you and the baby until you give birth. Expect to gain about a pound each week during the next two trimesters. If you are having twins, you can expect to gain more weight. Do not be alarmed if you do not gain exactly a pound a week. If you are concerned about the amount of weight you gained and your doctor suggests you could gain more, consider these steps: eat more frequently, eat calorie dense foods and add more dairy into your diet. You can add more dairy simply by adding butter or cheese to the meals you already eat. Do not add junk food to your diet just to put on weight. Try looking at your diet plan since finding out you were pregnant; if it’s considerably healthier than how you ate before you were pregnant, that may be the reason for not gaining weight. All women put on weight differently while pregnant. Do not be alarmed if you haven’t gained the same weight as a relative or friend. If you are seeing your doctor regularly, he will be able to help you monitor and track your weight. Any concerns you have about weight gain should be addressed to your doctor. Do not make severe dietary changes without first consulting your doctor. MayoClinic.com: Pregnancy weight gain: What's healthy?